Whatever you call it, this garment is quick fun to knit and is the perfect antidote to the cold shoulder. 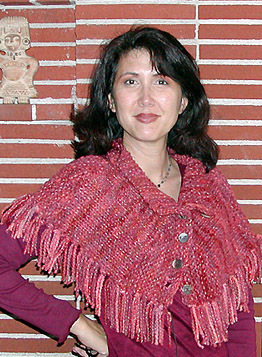 Unlike a real poncho though, this one won't mess up your hairdo! Wear it buttoned up the front, side or back, or unbutton it and fold down the collar. If you're really feeling bold, you can even wear it as a skirt! 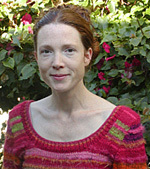 A Capella is knit side to side in one piece and uses garter-stitched short rows for shaping. I did not wrap my short rows and there are no visible holes. 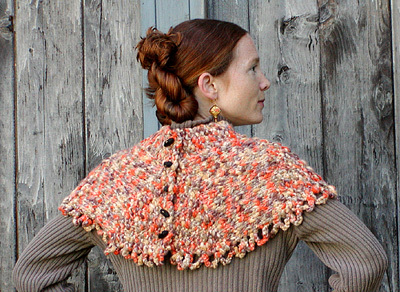 Depending on the yarn you use however, you may wish to wrap the turning stitches. If you have never used short rows before, don't worry. Simply knit the number of stitches called for, turn your work and knit back as if you had reached the end of the row. After all the short rows are worked, you will knit back and pick up all the orphaned stitches. Mondial Asia [60% wool, 9% Alpaca, 5% Nylon, 26% Acrylic. 72 yds/100 grams]; color: #147; 4skeins/260yards. Note: The wine-colored sample is knitted in a super-bulky wool boucle purchased on Ebay and hand-dyed with Kool-Aid. The crocheted edging takes slightly less yarn than the fringed version. Since this is not a fitted garment, gauge need only be approximate. Bear in mind that a larger gauge will yield a slightly larger finished garment. Rows 1-6: Knit [3 garter ridges]. Row 1: [RS] K 18, turn. Row 2 and all even [WS] rows in Wedge: Knit. Row 3: K 16, turn. Continue working in this fashion, knitting 2 fewer sts each RS row, turning and knitting back until you have used up all your sts (9 garter ridges). You've now completed the first half wedge of shaping. Next row: Knit full row [27 stitches]. Next row:: K7 [for collar], purl to end of row. Repeat these 2 rows for 22 rows. [It may be easiest to count 11 garter ridges on the collar]. You are now ready for the shoulder shaping. Row 2 and all even rows: Knit. Continue in this manner, knitting 2 more stitches on each odd [RS] row for 8 garter ridges until you have knit 18 stitches on your short row. Turn. Next row: Knit full row. Continue working short rows, knitting 2 fewer stitches on each RS row until you have worked the last [2 stitch] row, turned and knit back. Repeat the Stockinette and the Full Wedge sections 2 times. Knit a final Stockinette section [for a total of 4]. Now you will knit the final front shaped section. Continue as for other wedges, knitting 2 more stitches on each RS row until you have knit 18 stitches, turned, and knit back. Row 4: Knit row, casting on stitches above BO stitches. Weave in ends. Sew on buttons opposite buttonholes. For fringe: Cut approximately 240 pieces of yarn into 8-inch lengths. You will need about 55 yards of yarn to do this. Taking 2 pieces of yarn together, double them over and pull through bottom edge stitch. Pull loose ends through loop and pull to secure. Alternatively, for crocheted edging: Attach yarn at one button band, chain stitch 8 stitches, crochet through bottom edge of capelet 4 rows over [approximately 1 inch], chain another 8 stitches and crochet through bottom edge of capelet another 4 rows over. Continue working in this manner all the way to opposite button band. Attach yarn. Attach 5 buttons opposite buttonholes. Kristi promises not to design anything that is knit side to side in garter stitch for the next issue of Knitty. She lives with her husband and two daughters in San Diego, California. Pattern & images © 2002 Kristi Porter. Contact Kristi.